Not a huge fan of E Ink displays, but this latest toy from Sony will definitely be worth a closer look. The 13.3-inch A4 tablet showcased at The Fourth Education IT Solutions EXPO in Tokyo features a 1600 x 1200 screen and is 1/3 the thickness of a current gen iPad. Sony also claims the device will keep a charge for three weeks. And most interesting for readers of this blog is that where until now E Ink has been relegated to E-readers like the early Kindle, Sony's tablet is a creation device meant to replace paper and pencil for note-taking and other creative uses. Sony expects to release the product commercially by the end of the year. No word on the expected price, but tet's hope it doesn't include the usual Sony brand surcharge. Is Wacom coming after the Surface Pro? I'll admit I got a Surface Pro only because I can't afford a 20-plus inch Cintiq and the 12-inch version is getting long in the tooth. 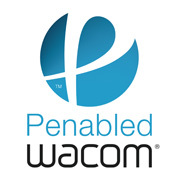 But reports surfaced this week that Wacom may be planning on releasing its own tablet sometime later this year. No word on operating system or pricing, but if the company were to deliver something that will run your Windows apps at a comparable price, wouldn't it be a no-brainer?